My sisters and I all bake. It's our heritage, our play, our therapy. At this time of year, I get a little carried away. So far, nine different kinds of cookies. And counting. Cinnamon rolls. Breads. During the month of December, I bake instead of write. And I think that's okay. The two processes are not so different after all: the combining of discrete ingredients into something greater than the sum of its parts. The shaping and then, magically, the rising. The application of heat. But at the end of baking you have something that is easy to give away, sweet and paranoia-free. 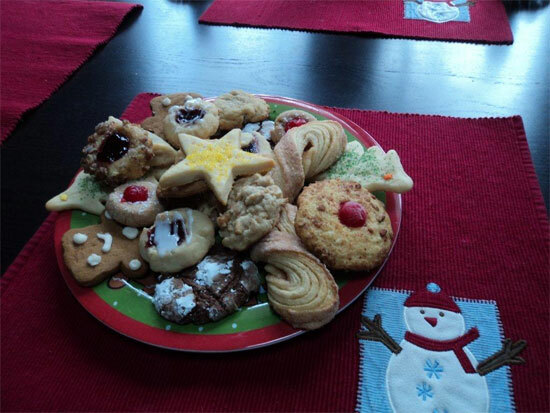 Forgot to say: that's a plate of cookies created by my sister Libby and me. Enjoy!